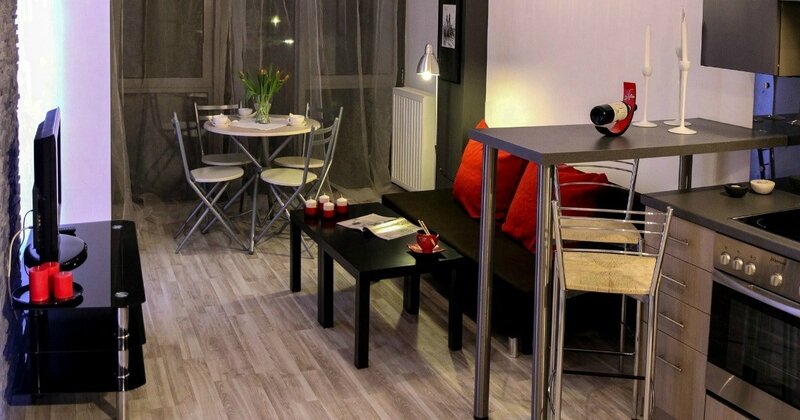 When it comes to small space living, clever space savers can make a big difference in the functionality of your home. Because when you live in a small space, convenience and efficiency really matter. Fortunately, there’s some cool products out there that can help you achieve both in your small home or apartment. Here’s 16 little space savers for your home that you probably never knew you needed! The links below take you to Amazon, where you can view all the details of these cool products. 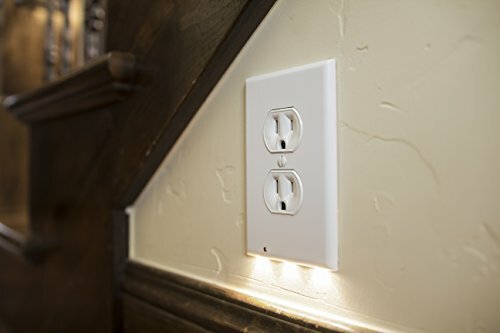 Instead of a bulky nightlight that uses up precious outlet space, try these nifty outlet coverplates with built-in nightlights. They fit all standard outlets and the nightlight contains a sensor that turns on and off automatically! Ironing boards are soooo 1950’s. For that matter, so are clothes that need ironing, IMHO. 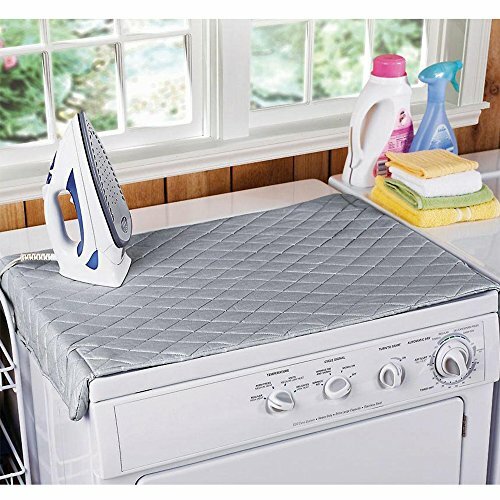 😉 But once in a while, if you do find yourself having to iron something, one of these magnetic ironing mats would be handy to have. 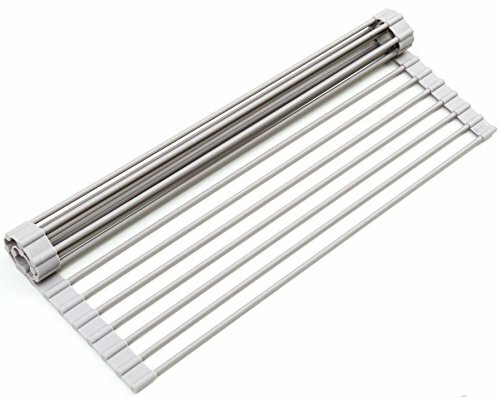 They turn any metal surface (like a washer or dryer) into a temporary ironing board and can be rolled or hung up between uses. 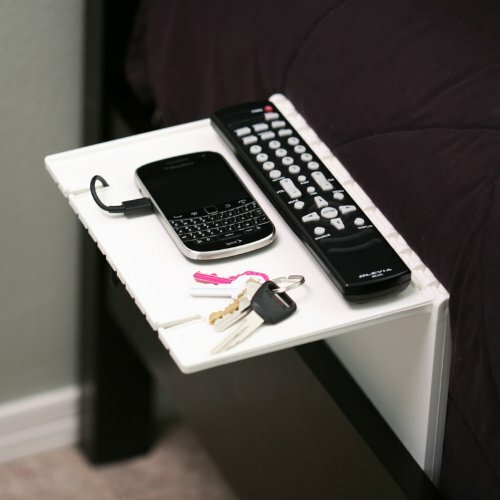 If don’t have room for a nightstand, this Urban Shelf is a clever solution to store your nighttime necessities. It even has convenient cord holders for your electronics and folds down completely flat. It can also double as a Kindle or Ipad stand. I love the versatility of this little space spacer! Furniture that folds down and out of the way are perfect space savers for small rooms. 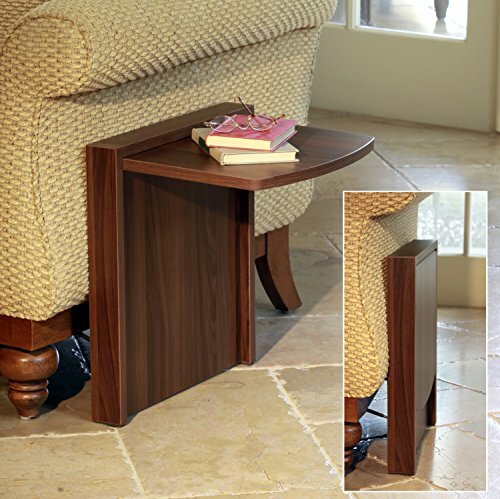 This Tuc-Away Folding End Table attaches to a chair or couch, or can be mounted to the wall. Pop it up when you need a place to put your drink, and fold it down flat when you don’t. Be aware that this doesn’t work well when attached to recliners, but you could mount it to the wall in that case. 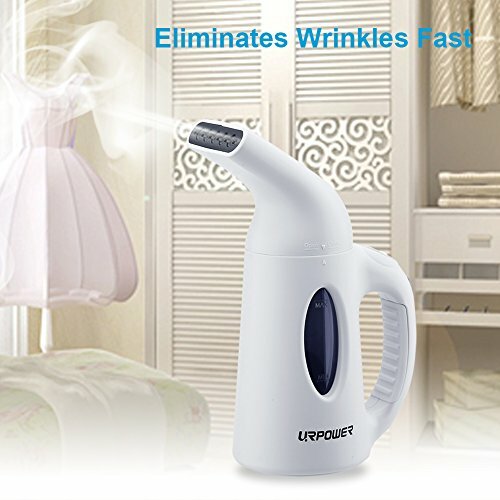 If you dislike ironing as much as I do, this little portable garment steamer is worth a try. It’s small and light and requires no ironing surface. Reviewers say it works great on all types of fabrics and can be easily stored on a hook or tension rod. Duel purpose pieces make great space savers in a room. If you need a floor lamp in your space, why not get one with a little built-in storage as well? 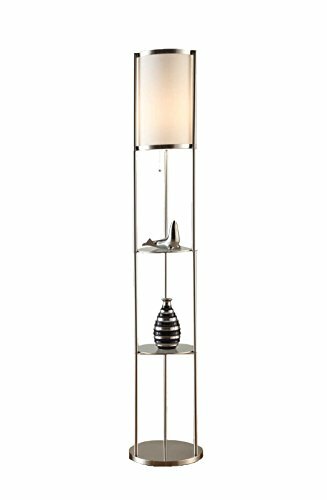 This modern lamp with attached display shelves has a sleek look and the convenience of shelves to stack your favorite reads or show off your family photos. This nifty little product is one of those why-didn’t-I-think-of-that kind of things. You can replace the bottom screws in any switchplate cover with one or two of these magnetic screws and have an instant place to hang your keys, a penlight, or any other item you need handy! These are extra strong magnets that hold 3 pounds of weight. Just make sure your keyring is made of a magnetic material. 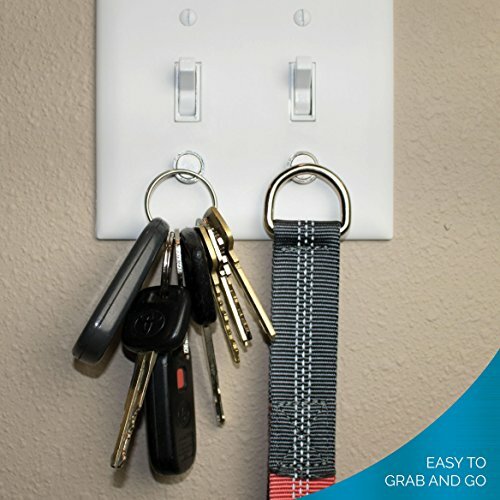 This is a clever solution for renters who want their keys by their door, but don’t want to hang a key rack. We think of these over the door storage products for a bathroom or bedroom, but how about putting one inside your coat closet? Many homes and apartments have a coat closet right by the front door. Put one of these Over the Door Hangers on it (facing either in or out) and you have a spot for your keys, sunglasses, hat, purse, whatever. It’s like an instant entryway without adding a wall shelf or table! Here’s a similar product that would work too. 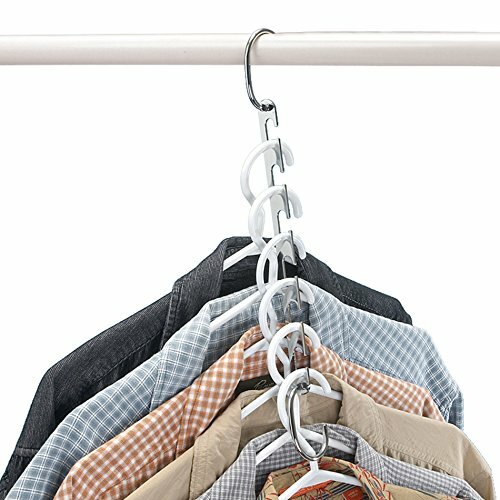 Vertical Hanger Organizers like these, are an inexpensive and easy way to quadruple your closet hanging space. 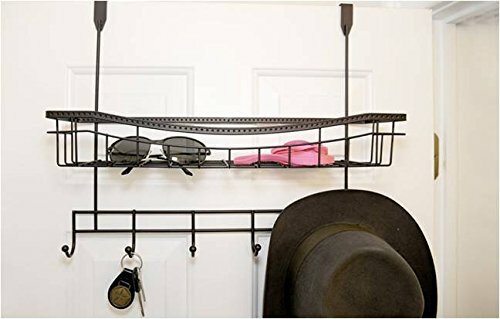 They hold metal or plastic hangers, are sturdy, and come in packs of 6 or 8. Here is another inexpensive solution if you don’t have room for side tables. Check out this remote control organizer with lots of storage pockets and a built-in tray. It sits on the arm of a couch or chair and keeps your remotes, phone, magazines, papers, and other necessities close at hand. 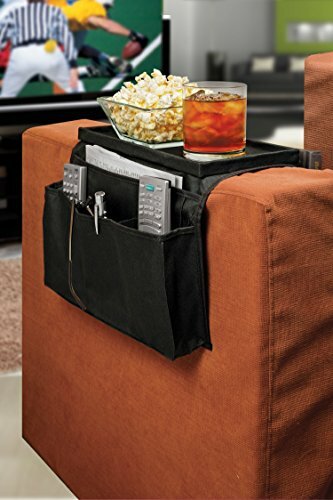 PLUS it has a hard tray top to hold your movie snacks and drinks. What more do you need? This fits over arms that are no more than 6 inches wide, so be sure and measure before you order. I love that you can move this around to anywhere you need it in the room! The best space savers are the ones that turn unused space into something useful. 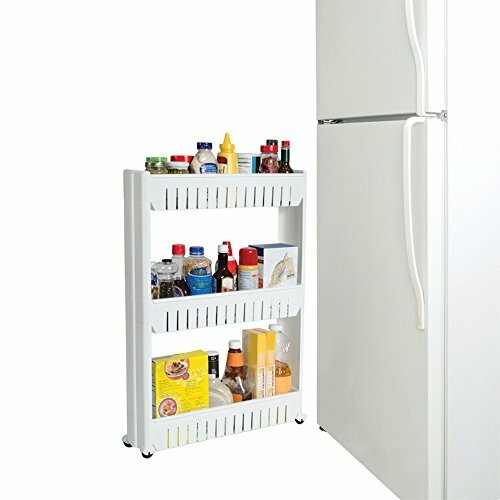 These Slide Out Storage Towers are perfect for beside the fridge, toilet, or washer and dryer. They come in two sizes, can be spray painted to match your decor, and have rave reviews. 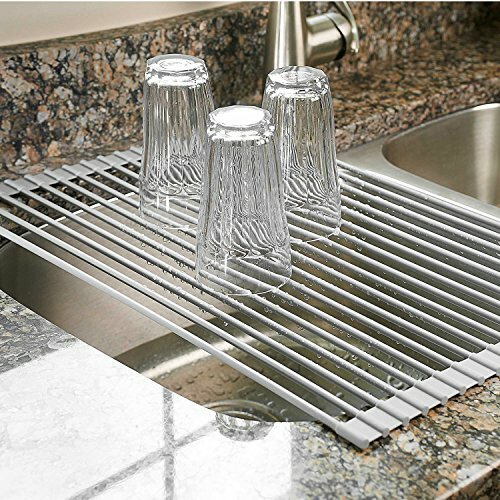 Dishes drying on your counter take up space, but then, so do dish drying racks that sit in your sink. 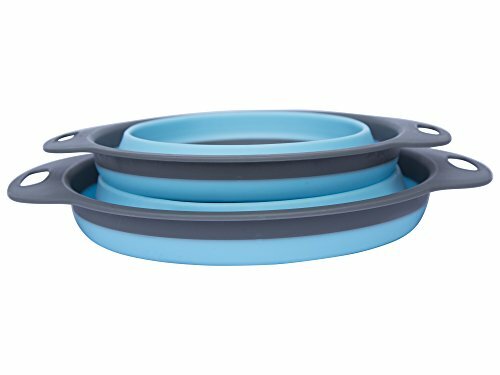 ThisRoll Up Dish Drying Rack is the perfect solution! Place it over the sink when you need it, and roll it up and stash it away when you don’t! A colander is one of those kitchen items you may not use often, but when you need one…you NEED one. This Collapsible Colander Set flattens down to about 2 inches high, making for easy storage. 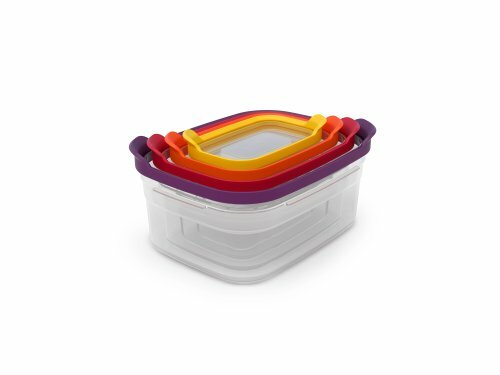 They’re heat resistant, dishwasher safe, and come in 4 colors! Everyone complains about having storage containers with missing lids, and vice versa (#FirstWorldProblems). At our house, I partially eliminated the problem by always putting the lids on the containers before I put them away. This kept the lids and containers together, but it sure took up a lot of room in the cupboards. With these Nesting Food Storage Containers, you can solve both problems. They stack neatly inside each other, and all the lids nest snugly on top. They’re freezer and microwave safe, too! These could have prevented a whole lot of kitchen conniption fits at my house! Also, that’s hard to say. Since we’re on the topic of nesting space savers, here’s another one. 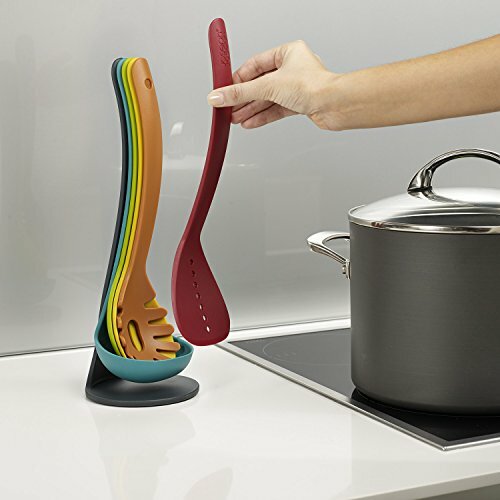 These Nesting Kitchen Tools with Magnetic Stand are so slim and compact, they can sit right on the counter. The set comes with 6 different kitchen utensils and they conveniently are held together with magnets in the handles. This would be a handy gift for someone with a small kitchen! Cut out the cutting board (and a few other kitchen tools) with this 5-in-1 Kitchen Knife tool by Wizard. 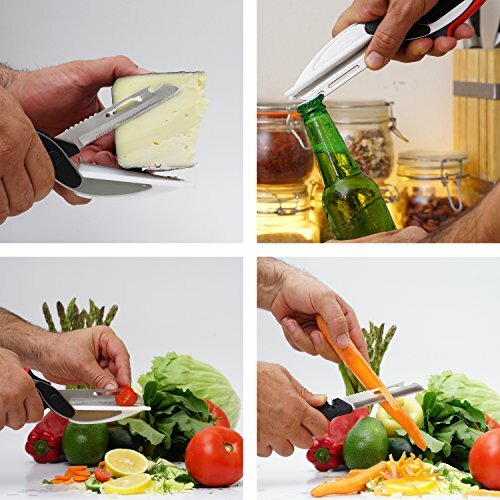 it cuts meats and vegetables, scissors style, plus is a slicer, peeler, and bottle opener. Save space by getting rid of tools you don’t need once you get one of these. If you’ve tried or want to try any of these space savers, we’d love to hear about it in the comments! Do you have any space savers for small homes that you swear by?